With activists under threat, are you ready to stand up and help them? Activism is under attack, and Rhize’s groundbreaking report, Understanding Activism, has the data proving that civil society is part of the problem but can also be a part of the solution. Download the report. Activists are struggling for open, democratic societies across the globe with access to few resources and little support. The concentration of existing support often comes from external actors—foreign governments, foundations, nongovernmental organizations, and private individuals—yet there has been insufficient research on how activists experience this support, until now. Understanding Activism breaks new ground by combining first-person accounts from activists with quantitative data across closed, semi-closed, and closing societies in order to understand the current support available to activists in contrast with what activists actually want. 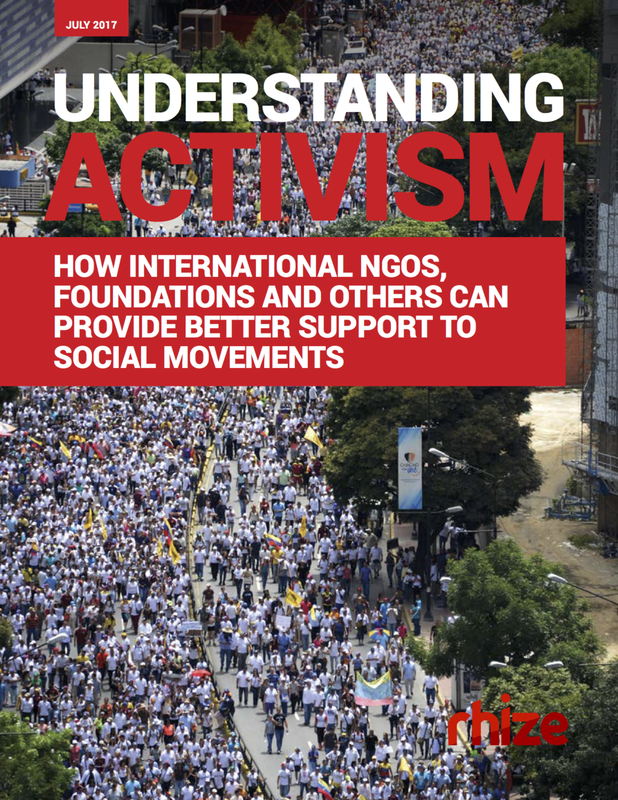 Understanding Activism provides critical insights into practices that can be adopted across civil society to ensure more effective support to nonviolent movements at the forefront of securing inclusive, participatory democracies. What type of support do activists receive? Which types of support are helpful or harmful? What types of support do activists really want? Activism is under threat, with conditions worsening for activists across almost all activities. Organizations and individuals receive different types of support, with external actors favoring short-term projects and more experienced individuals. Experiences of support are not consistently positive, with almost as many positive experiences of support as negative experiences in most countries. External actors have clear strengths and weaknesses when it comes to supporting activists. Activists have clear needs: they want closer collaboration, security support, amnesty or safe passage and media coverage. Tailor collaboration and support with activists’ needs at the center. Putting these recommendations into practice is no easy task, as this requires critical redesign of programming and funding priorities. To help, Rhize developed Adopting a Movement Mindset—a virtual course designed to help civil society better support grassroots movements to sustain action and momentum. Learn more about the course. Are you an activist looking for support? Rhize supports emerging leaders across the globe. Get in touch, and we'll help connect you with an upcoming training and long-term coaching support. Register for Rhize's course Adopting a Movement Mindset, and learn how you can help activists create people-powered change.